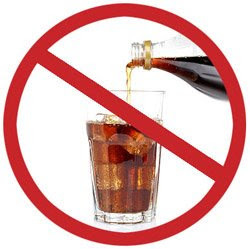 In yet another attempt to lose some weight without putting forth any more effort than already exerted, I am going to give up soda completely for 30 days and wait for the pounds to magically disappear. Traci and I were talking about what a sloth I have become and we came up with this bet: If I can go 30 days with no soda, then I get a new video game. If I fail the challenge, then she gets a one hour massage, performed by me. I am not the worlds largest fan of giving massages (I have long fingers... very delicate), and Traci flat out hates all the video games I play, so it is a good compromise on both sides. As of writing this post, I currently weigh in at 215 lbs standing 5' 11", with a wing span of 6' 3". The official weigh in is tomorrow morning and I anticipate it being significantly less (coffee and bagel induced weight loss, if you get my drift). I will let you know how it goes and whether or not this soda challenge is legit or if I am going to need to go with "Plan B", ingesting as much Olestra as possible. NO SODA IS GREAT FOR LOSING WEIGHT...I ALREADY TRIED IT. Did you ever consider just drinking diet?